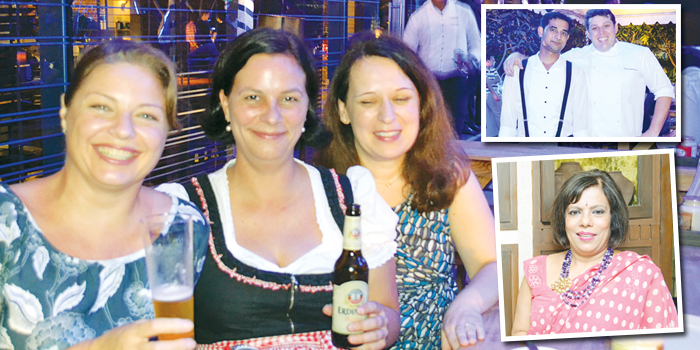 Halloween, Thanksgiving and now Oktoberfest, the latest addition to the Chennai cultural landscape. Beer lovers in the city rejoice, as a variety of special brews are offered at various venues, for a few weeks. I decided to drop in on the celebrations at the Hyatt Regency where theya��ve really gone all out to recreate the original feel. E xpatriates in traditional costume, platters piled high with meats, beer tents and big groups of people having fun. A lot of them hadna��t even met before but insisted that bonding over beer was part of the process. Chef Massimiliano insisted that we try a little of everything, which we did, with dollops of spicy mustard. Over the weekend, Mehta Jewellers presented a special collection by Minnie Menon, whoa��s now added a�?jewellery designera�� to the long list of things she does. The launch saw a packed house, with ladies landing up extra early to have first choice. An excited Minnie walked us through the collection, and helped guests pick out pieces that really suited them. Ask her about the creative process and she says ita��s all about imagery. She pictures the type of woman a certain piece is meant for, and the design flows from there. a�?Our bank lockers wear most of our jewellery,a�? she said a�?so I wanted to create something women could enjoy and wear easily.a�? Art continued to occupy centre stage this week with Gallery Veda and The Park Hyatt celebrating their first anniversary. The occasion was marked by a collaboration titled a�?Wonderlanda��, featuring some of Indiaa��s most respected women artists. Inaugurating the show and guaranteeing a crowd was actor Hema Malini, who it turns out is a discerning art collector herself. Ita��s no surprise that her fans had gathered in large numbers hoping to catch a glimpse of the dream girl. After the official launch, she took a walk around the hotel, and it appeared that an art installation by Benita Perciyal caught her eye. The crowd grabbed the opportunity to take all the pictures they wanted, while she was gracious enough to pose with them. Preeti Garg and Amit Mahtaney threw light on the works of art, as well as the collaboration, where in a way the hotel itself became the canvas. Preeti simply said, a�?Chennai needs a place for art interaction that goes beyond the four walls of a gallery.a�?